Prince Leopold was the youngest of Queen Victoria's sons. He was delivered with the aid of chloroform, administered by the royal accoucheur, Dr John Snow. Also in attendance were the Queen's midwives, among them a Mrs Innocent and a Mrs Lilly. The safe arrival of Prince Leopold didn't silence opposition to obstetric anaesthesia altgether; but the Queen's heartily expressed enthusiasm for pain-free childbirth helped make chloroform use respectable. Victoria's youngest child, Princess Beatrice, was delivered with the assistance of chloroform in 1857. 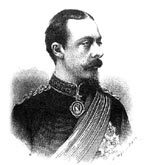 Prince Leopold was a haemophiliac who later struggled to lead a normal life.